The original Transformers toys had their origins in Japan in the form of two separate toylines, Microman and Diaclone, which were both product lines of Japanese toymaker Takara. All of the first wave of toys released in the U.S. in 1984 (as well as most of the 1985 toyline) came from molds from one of these original two toylines. The rest of the 1985 line came from other toylines from other asian toy manufacturers. All of the Autobot cars, the Decepticon Jets, and the original Optimus Prime toy (as well as Ultra Magnus) came from a toy line released in 1980 called Diaclone. These toys were well-made 1:60 scale models of actual real-world vehicles (with some die-cast metal parts) that were supposed to change into 'mecha' robots that were piloted by smaller beings, which explains why all the Diaclone toys have cockpits or seats where little people would sit. The original versions of these toys	actually came with these little pilots. The 1984-85 Transformers characters who change scale when they transform	were not from Diaclone, but were originally part of a 1983 spin-off of the original Microman toyline, called Micro Change. The Microman line began way back in 1974. The Microman line originally revolved around a miniature humanoid cyborg race who built the Micro Change robots to fight along side them against their enemies, the insect-like Acroyears. This concept was used to create all sorts of robots which changed into 1:1 scale objects, such as locks, wrist watches, pistols, and walkmen. The walkman toy, along with the first wave of tapes, would be later released as Soundwave and his cassettes. The Walther P-38 pistol toy was just one of three Micro Change pistol toys called Gun Robo, which also included a Browning and a Magnum 44. Only the Walther P-38 U.N.C.L.E. (the version with all the scopes and attachments) was released as part of the Transformers toy line, as the Decepticon leader Megatron. NOTE: The Microman line started in 1974, which is why Megatron and Soundwave have 1974 dates stamped onto them, though their actual molds came from around 1983, making them newer than the Diaclone toys. Many Transformers "experts" are incorrect in their asssumption that Megatron and Soundwave are the oldest of the Transformers molds. The 1:1 scale rifles and walkman would have been pretty big compared to the small Micromen themselves. This explains why the Megatron and Soundwave robot modes would be forces to be reckoned with... (Most people do not understand why a giant robot would want to shrink to the size of a gun or a tape player, but this origin of the toyline explains what the toymakers were thinking back in 1983.) The Diaclone line was actually an offshoot of the Microman line, shrunken down. The small pilots in Diaclone are actually supposed to be small 1-inch Micromen cyborgs, hence their silver heads. 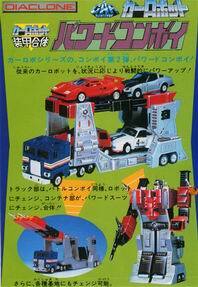 Other figures from the 1:1 scale of Micro Change toys that became Transformers were Perceptor, Reflector, and Blaster. The small Minibot Autobots (Bumblebee, Cliffjumper, et cetera) were molds that came from another branch of the Microman toyline called MiniCAR-Robo, which were disguised as Choro-Q cars, also known as Penny Racers. These "super-deformed" (squished) vehicles were obviously not meant to be realistic depictions of their real-world	vehicle counterparts. Hasbro reintroduces Microman and Diaclone in the U.S. When Hasbro hired Takara to manufacture new toys for their 80's revival of the G.I.Joe brand, they decided to license some of these Takara robot toys, which were 'all the rage' in Japan. Hasbro took these toys and merged them into one toyline and dubbed them Transformers. Figuring that kids would prefer the robots to have personalities themselves, Marvel Comics was brought on board to come up with a mythos for these characters. The task of developing most of the names and personalities for these toys fell mostly on Marvel writer Bob Budiansky, who is responsible for coming up with classic names such as Optimus Prime and Megatron. Budiansky was also hired to write most of the "Tech Specs" which were printed on the boxes of the toys, and later went on to become writer and story editor for the Transformers comic. When the toyline (and 3-part television mini-series) became such a huge success, Hasbro expanded the line in 1985 with more Takara Diaclone molds, such as the Dinobots, Insecticons, Constructicons, Jumpstarters, Blitzwing, and Astrotrain. They also ordered 2 seasons of a TV series to be syndicated daily, and began production on the feature film. Hasbro also licensed some molds from other toy Japanese companies, such as the Deluxe Vehicles Whirl and Roadbuster, the Deluxe Insecticons, and the Autobot jet Jetfire. Since most of these toys had tie-ins with non-related Japanese TV series (such as Macross, in the case of Jetfire) and competed with Takara's toylines in Japan, most were not used on the U.S. television series. Jetfire was able to appear the TV series, so long as he was given a slightly altered appearance (and for some strange reason, an alternate name, Skyfire). The only other non-Takara toys which appeared on the TV series were Shockwave, which was from a Korean company called ToyCo (whom also licensed the toy to Radio Shack, due to its electronic lights and sound), and Omega Supreme and Sky Lynx, which were from a company called Toybox. For more information about Pre-Transformer Toys, visit: The Pre-Transformers Page. It is really an interesting read. Also, for info about the entire Microman and New Microman toy lines, visit Microman Forever. When Hasbro started production on the movie in 1984, they set out to design all new characters from scratch for the film. Most of the characters were designed by Production Designer Floro Dery, with the exception of Ultra Magnus, which was the only movie character to be based upon a toy first, instead of the other way around. The task then was to design completely new molds for the toys based on the character designs. (This could explain why some of the movie toys were not as well-designed as many of the pre-movie toys.) Thus, the movie toys were pretty much the FIRST original Transformers ever, since all previous toys that were released under the Transformers brand came from existing molds. 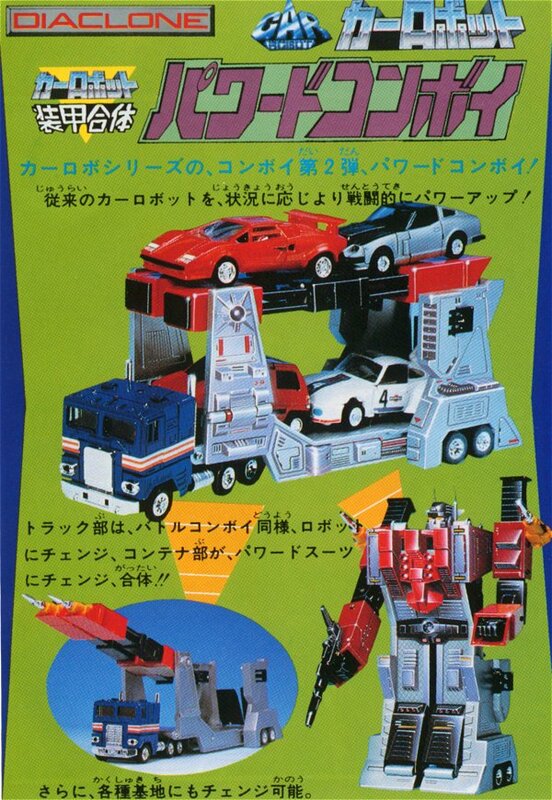 Meanwhile, in 1985-1986, while production on the feature film continued, Takara started designing an all new toyline	for release in Japan, which would cross-over into the U.S. under the Transformers brand. This new toyline was dubbed	"Scramble City" in Japan, and included all the combiner teams that came after Devastator, such as the Aerialbots, the Stunticons, the Protectobots, and the Combaticons. These teams worked together to protect their respective city bases, which later in 1986 were released in the U.S. as Metroplex and Trypticon. Since these toys/characters did not yet exist when the film was first being written and developed, none of these characters appear in the movie, but do appear in TV episodes which take place before the movie. Footage from the U.S. television series was re-assembled to produce a 30 minute TV special advertising the Scramble City toyline, to be released in Japan only. Additional footage was added of Metroplex being constructed and the combiner teams duking it out. It is an interesting video to watch, as we get to see footage of Spike, Carly, Chip and Sparkplug helping to build Metroplex. The footage of Metroplex emerging and rolling over the landscape crushing trees and foliage is quite well-animated. 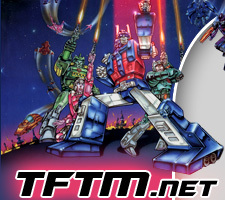 DISCLAIMER: Tftm.net is not run by, owned by or licensed by Hasbro Inc., Sunbow Productions, or Takara Ltd. or any of their licensees or subsidiaries. This site has been established by fans of these licenses for informational and entertainment purposes only. Transformers, Beast Wars, Autobots, Decepticons, and other Transformers related titles are copyrights and trademarks of their respective owners, and used here out of respect for these properties.